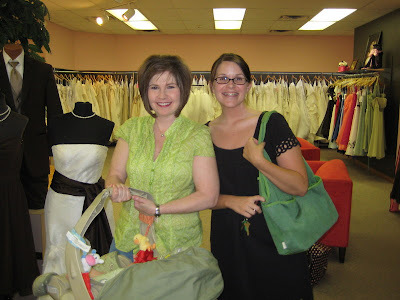 Tonight after work - I headed over to Laurie's so we could drive to Fayetteville and try on our bridesmaid dresses for alterations. Emily was sitting in the back in her pink sunglasses chewing gum and she reminded me of Elle Woods in "Legally Blond" - I could not quit laughing at her. I made the mistake of giving her a piece of gum out of my purse a few weeks ago and now I am her dealer. Every time she sees me she wants gum and if I don't get it out fast enough she dives for my purse. We told Emily we were going to a "princess store" and she had the time of her life. We dressed her up like a bride. I told Laurie I would send her this picture and she could use it in Emily's wedding slideshow and I thought Laurie was going to have a breakdown right there in front of me - her eyes started welling up. 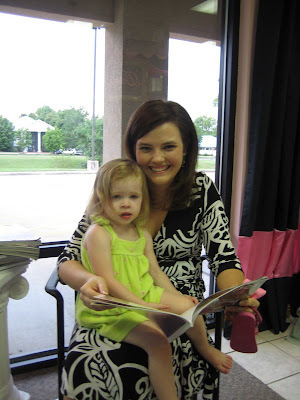 If she is anything like her momma or her Aunt Kelly - Laurie doesn't have to worry about the wedding for about 27 more years. ha! Laurie and the bride. I had a good time looking at wedding dresses. There are just so many beautiful ones out there. I wish I could buy a new one every few years to wear. Shannon was a good babysitter while Laurie and I talked to the owner. She was so nice and she thought I looked like her daughter-in-law so she was telling me all about her and then she told me she went to OBU too and she went over to the computer to pull up her blog to show me what she looked like. I wanted to tell her I blog - but I refrained. How fun! Emily is the cutest little girl I have ever seen!! I love wedding dresses. When you said you would like to buy one just to wear, it reminded me of the episode of Friends when the girls are sitting around in wedding dresses drinking to make themselves feel better! I am laughing so hard at YOU laughing so hard, because I have SO been there! And Emily in the veil is DARLING! I want to go to the "princess store" myself! Were you at Briar Patch? E in the wedding dress is so precious! I can see how Laurie would get emotional though. Lane said something about Alexee getting married last time we were at a wedding and I cried through most of the wedding after that comment. The comment about Emily's whippin' made me laugh so hard. Things like this make you realize that you're finally a grownup. Everything about this makes me giggle from Emily in those glasses and that wedding dress to the scene in the parking lot. Hilarious! Life DOES go by fast! Sounds like such a fun night! That picture of Emily is priceless! And precious too! And the story about the whipping had me cracking up! ps. I sent you an invite to our baby's blog! What a fun girls night. Emily looks adorable in that wedding gown! So precious! Little Emily is too cute! I love those little pink sunglasses. Life does go by too fast! It is amazing how quickly time flies. Life really does fly by, but it is so cool how all of you have been sweet friends through the years. 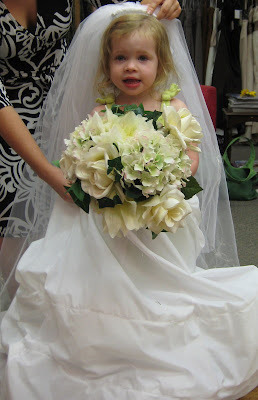 That picture of Emily in the bride's dress is just too adorable!! That will show up again in the future (probably at a rehearsal dinner!) for sure! I love the pic of Emily in the veil! Too cute, I just love her!!! 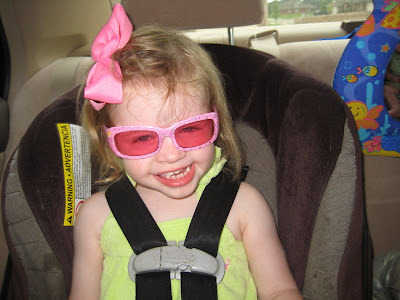 AWW Emily is just a doll with those pink glasses! Oh and the picture with her dressed as a bride is so priceless! How funny! Glad ya'll had such fun! Y'all are crackin me up over the whipping in the good ole parking lot!!! How many times have my hubs and I do something like that and just all but lose it behind their backs! The pix are so cute. That darling little girl is something else in that dress. Happy weekend. Hope you are feeling great! I am in a wedding next year and was at a bridal shop a few days ago. I felt the same way about wedding gowns. I found 'the one' while I was there. Too bad, I've been married 5 years and have 'the one' preserved in a box in my closet. They are just so pretty. It also helped that my son kept saying pretty, he never says I look pretty. That is one stylin girlfriend sitting back there in her carseat!!! And Laurie and Sarah Kate both look so pretty sitting there at supper as well. :) What a fun trip with the girls!!! Glad ya'll had fun! You are so funny! I can just hear you trying to contain that sweet laugh of yours. How funny! You are right. Time goes by so quickly! You are blessed to have good friends to spend it with! So you only have 3 days left before you find out! Oh gosh I know you're so excited and I can't wait to find out either!!! Ditto on that! I think it is absolutely precious that you have stayed friends throughout your life...such sweet memories! Well, I have to say, I LOVE this post! This was the highlight of Emily's life. She was just in awe of herself all dressed up. I had so much fun! Check out my blog for some fun for you!! Looks like ya'll had a great time! I'm sure you looked adorable in your bridesmaid dress...was hoping to see a pic! I can totally relate about eating at the same restaurant in college. My friends and I would pratically help Bennigan's unlock their doors waiting for them to open! ha! Hi Kelly, I've visited your site a few times before and you are too funny! I would be whipping out the tissues if was Emily's Mom, that picture is so adorable and priceless! Come over and visit sometime! Emily in the veil was so precious. I am so excited to see what Baby H is, and I bet you can't wait!You're both in my prayers!! It sound like you two had such a great time, I love all the pics. What a fun time! I love to look at wedding things, especially dresses. It's great to have such long time friendships. I love Emily's bride shot!! Perfect for a wedding slide show. 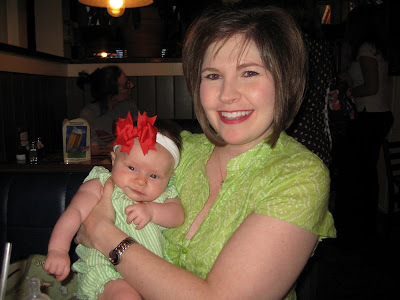 Hey Kelly -- I've stumbled across your blog and fallen in love with your style, your love for Christ and your happiness! I just wanted to let you know that I've stopped by and will continue to from time to time. Congratulations on your little bundle ! Sounds like you had a great weekend:) Remind me again when you find out what you are having? I am dying to know!! !